Gerald Rudolph "Jerry" Ford, Jr. (born Leslie Lynch King, Jr.; July 14, 1913 — December 26, 2006) was the 38th President of the United States from 1974 to 1977. He is the only president who has not been elected to the office of either President or Vice President. He was born on July 14, 1913, at 3202 Woolworth Avenue in Omaha, Nebraska, where his parents lived with his paternal grandparents. (the parents of his father) His birth name was Leslie Lynch King, Jr.. His mother was Dorothy Ayer Gardner, and his father was Leslie Lynch King, Sr., a wool trader and son of prominent banker Charles Henry King and Martha Alicia King (née Porter). Dorothy separated from King just sixteen days after her son's birth. She took her son with her to the Oak Park, Illinois. This was where her sister, Tannisse, and brother-in-law, Clarence Haskins James, lived. After that, she moved to the home of her parents, Levi Addison Gardner and Adele Augusta Ayer in Grand Rapids, Michigan. Dorothy and King divorced in December 1913; she got full custody of her son. Ford's paternal grandfather Charles Henry King paid child support until shortly before his death in 1930. Ford later said his biological father had a history of hitting his mother. James M. Cannon, a member of the Ford administration, wrote in a Ford biography that the Kings' separation and divorce were sparked when, a few days after Ford's birth, Leslie King threatened Dorothy with a butcher knife and threatened to kill her, Ford, and Ford's nursemaid. Ford later told confidantes that his father had first hit his mother on their honeymoon for smiling at another man. After two and a half years with her parents, on February 1, 1916, Dorothy married Gerald Rudolff Ford, a salesman in a family-owned paint and varnish company. They then called her son Gerald Rudolff Ford, Jr. The future president was never formally adopted, however, and he did not legally change his name until December 3, 1935; he also used a more conventional spelling of his middle name. He was raised in Grand Rapids with his three half brothers from his mother's second marriage: Thomas Gardner Ford (1918–1995), Richard Addison Ford (born 1924), and James Francis Ford (1927–2001). Ford also had three half-siblings from his father's second marriage: Marjorie King (1921–1993), Leslie Henry King (1923–1976), and Patricia Jane King (born 1925). They never saw one another as children and he did not know them at all. Ford was not aware of his biological father until he was 17, when his parents told him about the circumstances of his birth. That year his father Leslie King, whom Ford described as a "carefree, well-to-do man who didn't really give a damn about the hopes and dreams of his firstborn son", approached Ford while he was waiting tables in a Grand Rapids restaurant. Ford was involved in The Boy Scouts of America, and earned that program's highest rank, Eagle Scout. In his later years, Ford received the Distinguished Eagle Scout Award in May 1970 and Silver Buffalo Award from the Boy Scouts of America. 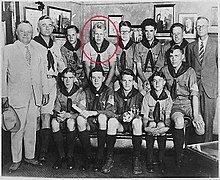 He is the only U.S. president who is an Eagle Scout. He played football when he was in high school and college. Ford served 25 years in the United States House of Representatives and was Minority Leader for many years. When Richard Nixon was President, his first Vice President was Spiro Agnew, but Agnew resigned in 1973 because he took bribes while he was Governor of Maryland in the late 1960s. Nixon then chose Ford to be his next Vice President. Ford had to be approved by Congress since there was no Presidential election that year. Because he had been in Congress for a long time, other Congressmen knew him well and were happy to approve him as Vice President because they thought he was honest. However, Ford was not Nixon's first choice. Some of his first choices were John Connally (the former Governor of Texas), Nelson Rockefeller (the Governor of New York), and Ronald Reagan (the former Governor of California). But, Nixon was worried that these other men might have trouble getting approved by Congress. All of them had also run for President already or were planning to run soon. Nixon did not want to help pick who would be the top Republican candidate in 1976 and Ford promised him that he was not interested in being President. Ford always told reporters that he always dreamed of being Speaker of the House instead. Because of the Watergate scandal, Nixon resigned on August 9, 1974. Ford became the President. He is the only President of the United States not to be elected to either the office of President or Vice President. Once he became President, he realized he could do a good job and decided to run for a full term in 1976. He ran against the popular conservative Ronald Reagan for the Republican nomination in 1976. Ford won by a small number of votes against Reagan. In 1975, Ford was nearly assassinated in Sacramento, California. Ford had pardoned Nixon for his crimes in 1974. Many experts say that is one of the reasons why Ford lost to Jimmy Carter in the 1976 election, which was very close. Other reasons for the loss were a bad economy with a lot of inflation, the Mayagüez incident, and the last U.S. soldiers leaving Vietnam followed by Saigon and the rest of South Vietnam being taken over by the North Vietnamese, both in 1975. With his somewhat short 895-day presidency (less than one term), he was often seen as a place holder in between Richard Nixon and Jimmy Carter. The way he handled the Watergate scandal has changed people's view of him. While critics felt that pardoning Nixon was not fair, his supporters felt like his term provided a sense of healing and comfort to a country that was morally divided. He was also a much more moderate Republican than the more conservative Ronald Reagan. Ford was adopted at a young age. His birth name was Leslie King, Jr. He married Betty Warren in 1948. Ford died in his home in California on December 26, 2006 from cardiac arrest caused by cerebrovascular disease and coronary artery disease at the age of 93 years and 165 days. No other president ever has lived to be that old since Ronald Reagan back in 2004 and then eventually George H. W. Bush in November 2017 when he became the oldest living ex-president. ↑ Wright, John (2001). The New York Times Almanac 2002. Routledge. p. 96. ISBN 9781579583484. ↑ Young, Jeff C. (1997). The Fathers of American Presidents. Jefferson, NC: McFarland & Co. ISBN 0-7864-0182-6. ↑ Funk, Josh (December 27, 2006). 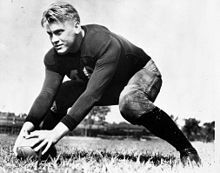 "Nebraska-born Ford Left State as Infant". Fox News. Associated Press. Retrieved December 31, 2013. ↑ Cannon, James. "Gerald R. Ford". Character Above All. Public Broadcasting System. Retrieved December 31, 2013. ↑ "Gerald R. Ford Genealogical Information". Gerald R. Ford Presidential Library & Museum. University of Texas. Retrieved December 31, 2013. ↑ Kunhardt, Jr., Phillip (1999). Gerald R. Ford "Healing the Nation". New York: Riverhead Books. pp. 79–85. Retrieved December 31, 2013. ↑ 7.0 7.1 Townley, Alvin (2007) [December 26, 2006]. Legacy of Honor: The Values and Influence of America's Eagle Scouts. New York: St. Martin's Press. pp. 12–13 and 87. ISBN 0-312-36653-1. Retrieved December 31, 2013. ↑ "Ford eclipses Reagan as oldest ex-president". USA Today. 2006-11-12. Retrieved 2009-09-21. White House biography about Ford. This page was last changed on 22 April 2019, at 00:53.